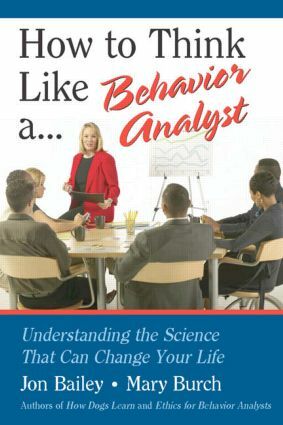 How to Think Like a Behavior Analyst is a revolutionary resource for understanding complex human behavior and making potentially significant quality of life improvements. Behavior analysts offer a worldview of the human condition different than almost any other professional perspective. To a behavior analyst, human behavior is largely learned and subject to change if the right variables are put into play. This is an empowering outlook, providing an opportunity for individuals to analyze the actions of those around them and an understanding of why others exhibit such behavior. Practical, clear, and direct, this book addresses basic questions such as how behavior analysis is different from psychotherapy, what analysis involves, and the meaning of evidence-based treatment. A chapter on Applications presents tips on using behavioral procedures to improve lives and deal with others, and articulates how behavioral procedures are used in community settings. In question and answer format, the text thoroughly covers 50 frequently asked questions about behavior analysis in an educational and entertaining manner. It was developed out of questions raised by students in behavior analysis classes over the last 35 years, as well as questions raised by consumers of behavior analysis services. This textis written for all professionals concerned with behavior, including undergraduate students in psychology and behavior analysis, parents, teachers, employers, and employees. The book can easily be used as a supplement to primary texts in introductory psychology courses, and the exercises that follow each question can be used to stimulate lively discussion in role-play and other active learning situations.